Chiropody is healthcare for the feet and lower limbs. The most current term used to describe Chiropody is the word Podiatry. 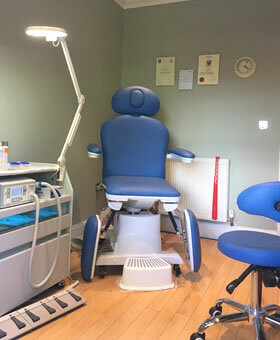 At the initial appointment all patients will be required to complete a form with the Podiatrist that will contact details and a brief medical questionnaire. Please remember to bring along a list of current medications. This treatment will involve a thorough foot health assessment. During this appointment you will be able to discuss any concerns that you have about your feet. A footbath is used to refresh and cleanse your feet and any areas needing care will be treated. This may include trimming nails and reducing hard skin and corns. Footcare will be discussed throughout and a brief foot massage will be offered to complete your appointment. This appointment is available to offer care for one specific problem. A spray will be applied to cleanse the foot and necessary treatment will be given. This appointments offered to existing patients with foot problems requiring checking or redressing as part of their treatment plan. This is a minor surgical procedure offered to resolve acute and chronic nail conditions i.e. ingrown toe nails. Please note 4 separate appointments are included in the treatment price. Functional insoles and orthotics are devices designed to wear within your shoes that can reduce pain and improve foot and limb function. The above list is by no means complete. If you have any other problems or concerns, please call to discuss.